The last emperor of Vietnam, who ascended the throne in 1926. Bao Dai proved to be an ineffective ruler and was unable to exercise any of his powers without the support of the French colonial regime. The 34th U.S. president, who popularized the domino theory that was later used to increase U.S. political and military involvement in Vietnam. 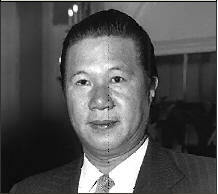 Vietnamese nationalist and Communist leader in the twentieth century, who resisted French, Japanese, and American influence in Vietnam. The 36th U.S. president, who promised to honor his predecessor John F. Kennedy's limited U.S. commitments in Vietnam. The 35th U.S. president, =decision to send U.S. “military advisors” into Vietnam in 1962 marked the first official U.S. involvement in the country.